Want to find the best chats for social media marketing? Participating in Twitter chats is an excellent way to network without traveling, grow your following and display your authority. 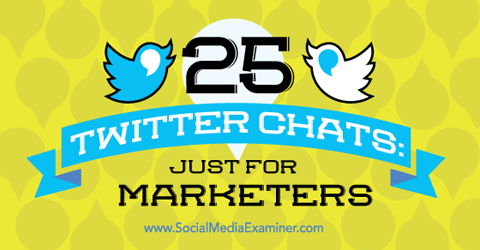 In this article you’ll discover 25 Twitter chats for marketers. 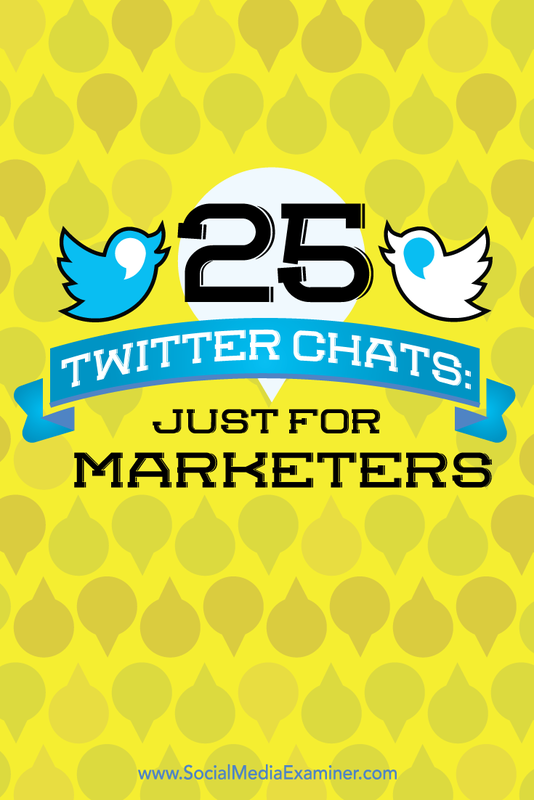 Discover 25 Twitter chats for marketers. Twitter chats are extremely beneficial for getting noticed and growing your following. Choose chats that are relevant to your industry, and are led by solid marketers with hundreds to thousands of followers and an established reputation. When you provide useful answers to chat questions on a regular basis, you’ll eventually get noticed by the right people who will mention and retweet you. Also, you’ll get more followers and a ton of exposure each time you participate in a Twitter chat. This is real-time engagement. You have the potential to learn new things, meet new people and build relationships. To join a Twitter chat, put the hashtag in Twitter search or in your Twitter management tool. Here are 25 valuable Twitter chats for online marketers. Smarter Shift hosts #ContentChat, which brings marketers together to learn about the latest trends and developments in content marketing. Get valuable information about content marketing at #ContentChat. ContentChat takes place Mondays at 12pm PST. If you’re looking for basic marketing tips, assistance with branding and other general business questions, check out #InsiderChat, hosted by Brian Honigman. InsiderChat takes place on the last Wednesday of every month at 10am PST. It’s on hiatus until January 2016. Since LinkedIn is an outstanding business network for making connections, their #LinkedInChat clearly has a lot of value. People always have questions or topics they want to discuss regarding the platform, so this is the perfect venue. LinkedInChat takes place Tuesdays at 5pm PST. 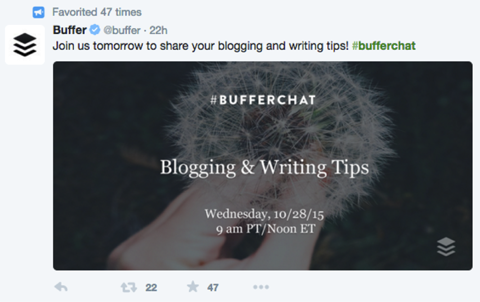 Buffer uses #Bufferchat to focus on a variety of topics for digital marketers. Chances are you’ll find multiple discussions that pertain to your marketing needs. Buffer hosts a weekly chat on Mondays. Bufferchat takes place every Wednesday at 9am PST. Go to the Bufferchat blog for recaps. Hosted by Michelle StinsonRoss and Alan K’necht, #SocialChat is perfect for marketers who want to amp up their social strategy. Read the Noob’s Guide to their chat, too. SocialChat takes place Mondays at 6pm PST. Content Marketing World hosts #CMWorld, which helps participants get the most out of their content game with great resources and tips. Check out their archive of chat transcripts. CMWorld chat takes place Tuesdays at 9am PST. 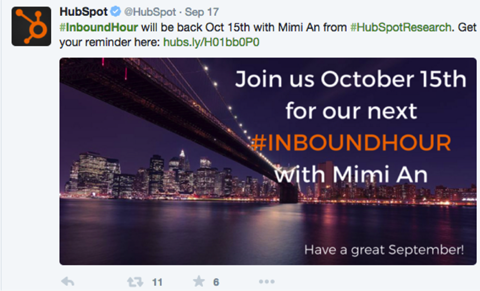 HubSpot’s #InboundHour chat focuses on tips for inbound marketing, which is likely an important part of your strategy. HubSpot hosts #InboundHour every Tuesday. InboundHour takes place Tuesdays at 10am PST. To keep on top of the latest in SEO, join #SEOChat, hosted by Search Marketing Weekly. They often answer questions in real time, and their relevant SEO topics prompt a lot of good insights from the marketers who join the chat. 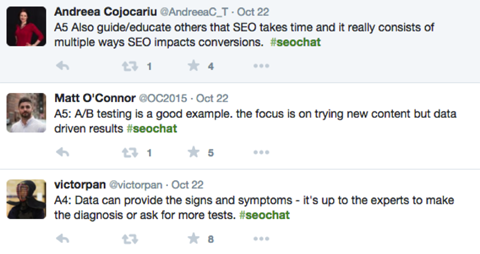 Join #SEOChat to get your SEO questions answered often in real time. SEOChat takes place Tuesdays at 10am PST. If your goal is to connect with top influencers in the marketing world, try #SEMrushchat from SEMrush. 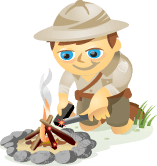 Their topics focus on easily applicable content and SEO tips and practices. 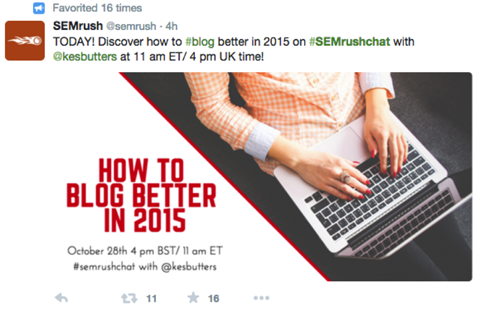 For topical conversations relating to influencers, try #SEMrushchat. SEMrushchat takes place Wednesdays at 8am PST. Extreme Networks hosts #HubChat, which shares the latest advances in tech and how they’ll impact your business, as well as marketing-related discussions. It’s an excellent resource to round out your strategy and campaigns. HubChat takes place Wednesdays at 12pm PST. To create a better community for your clients and business, check out #BizHeroes, hosted by Kelly Hungerford, a Switzerland-based digital operations specialist and social brand strategist. This is a great chat for anyone looking to improve their strategy and connect with like-minded people in these areas. BizHeroes chat takes place Tuesdays at 11am PST. Sprout Social’s #SproutChat focuses on a variety of aspects within social media marketing, such as where to place your calls to action. Join #SproutChat to get excellent insights from people within your industry. SproutChat takes place Wednesdays at 12pm PST. Social media influencer Pam Moore hosts #GetRealChat, which explores gritty topics about social media and content marketing. It can act as great inspiration for content, as well as much-needed encouragement to get your content out there. GetRealChat takes place Tuesdays at 6pm PST. Kiki L’Italien created #AssnChat, which is a great social media get-together. This community is fantastic, whether you’re a staff member at a marketing firm or a business owner looking for marketing tips. AssnChat takes place Tuesdays at 11am PST. Want to boost your social media marketing strategy to get great results? 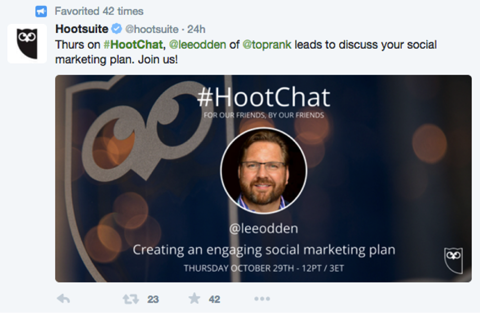 Then #HootChat from Hootsuite is for you. Boost your social media strategy with tips from #HootChat. HootChat takes place Thursdays at 12pm PST. Coming up with new ideas and topics for your blog can get overwhelming, even for expert bloggers. On #BlogChat, founded by Mack Collier, you can discuss topic ideas with other marketers. While some might not be specific to your industry, you can always adjust them to match you and your business. BlogChat takes place Mondays at 6pm PST. What do you need to know about search engines, PPC campaigns and those ever-necessary keywords? Head on over to the #PPCChat for information from insiders and industry leaders. Check out their guides and archives of previous chats on their website. PPCChat takes place Tuesdays at 9am PST. Marketing your unique brand has several benefits. To get tips from people both inside and outside your industry, join #BrandChat, hosted by Personal Branding Specialist Maria Elena Duron. The questions asked on #BrandChat often revolve around new things in the marketing space. BrandChat takes place Wednesdays at 8am PST. The Social CMO’s Marketer Monday Chat, also known as #MMChat, derives a lot of information from marketing firm executives. Learning from some of the top people in the industry is a great way to develop an incredible strategy. MMChat takes place Mondays at 5pm PST. 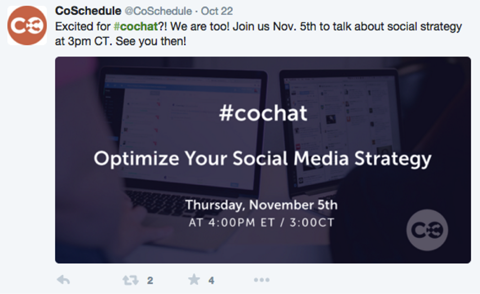 If you’re looking for great editorial strategies and general content marketing tips and tricks, #CoChat, hosted by CoScheduleApp, is definitely for you. Get excellent editorial resources and tips during #CoChat. CoChat takes place Thursdays at 1pm PST. Want to leverage social media to bring about excellent conversions? Ask your questions and read other responses at the #SBizHour chat. This is a great way to learn about how to use social media for your brand and make it work for you. Hosts Brian Fanzo and Rachel Miller bring in a guest each week to cover different topics. SBizHour takes place Mondays at 1pm PST. Need more inspiration for your content marketing? Hosted by Atomic Reach, #AtomicChat offers motivation for your content marketing and is great for community-building. AtomicChat takes place Mondays at 6pm PST. If you’re looking for more tips on being a better entrepreneur, creating personal branding or having a good balance between your work and personal life, then CloudPeeps’ #PeepChat is for you. 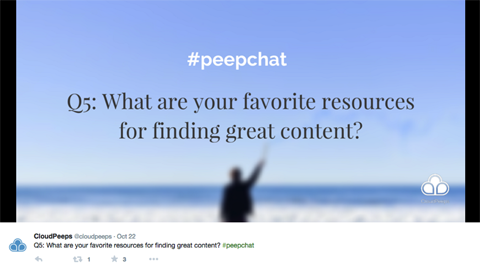 Learn how to improve your personal brand and your business on #PeepChat. PeepChat takes place Thursdays at 11am PST. An excellent chat for female entrepreneurs, #AWCConnect provides enlightenment on a lot of different areas. It helps female marketers and business owners get the most out of their operation. Follow Sheila Scarborough for more information. AWCConnect takes place the first Thursday of every month at 10am PST. A weekly Google hangout and Twitter chat, #CMGRHangout from My Community Manager focuses heavily on community-building and management. Learn about what goes on behind community management, its psychology and much more. CMGRHangout takes place Fridays at 11am PST. When you start engaging in a Twitter chat, there are a few things to consider. First, follow basic Twitter chat etiquette. Know the rules for your chat and follow them. If you can’t find the rules, ask others who’ve previously participated. Also, let your Twitter followers know when you’ll be starting a Twitter chat about 30 minutes before it starts to give them the chance to mute you or follow along. Next, be sure to answer questions throughout the chat, but also favorite, retweet, quote tweets and follow others. When you mention and interact with people during a chat, you will start to increase your Twitter following. Finally, know and use the right hashtag throughout a Twitter chat, so your tweets get noticed. What do you think? Do you participate in Twitter chats? Which ones do you recommend? Any advice for those who are new to Twitter chats? Please share your thoughts and experience in the comments. 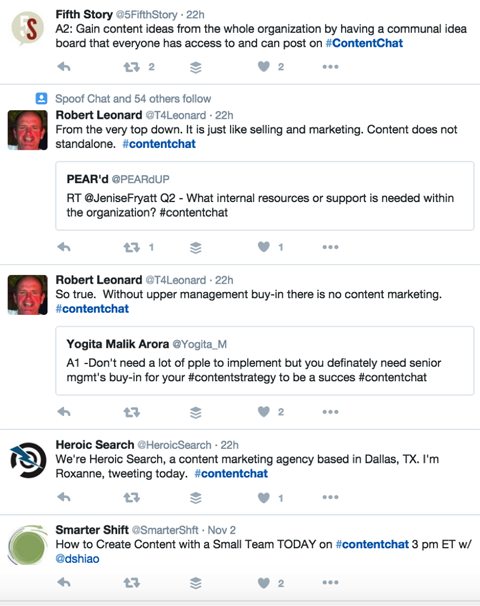 A list of 25 Twitter chats just for marketers. Julia McCoy, the bestselling author of So You Think You Can Write?, hosts The Write Podcast and #ContentWritingChat. Her company, Express Writers, has over 70 writers and thousands of clients.